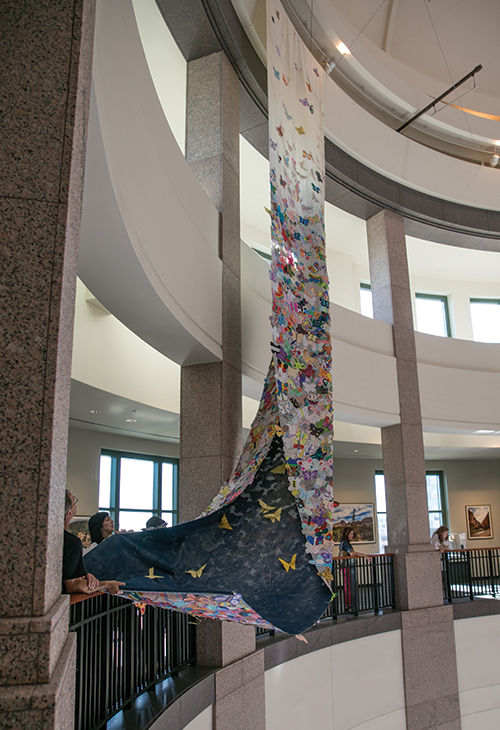 Something beautiful trapped by forces beyond its control is the basis for the Butterfly Project, an art installation that was on view at the Bullock Texas State History Museum through Jan. 13, 2017. 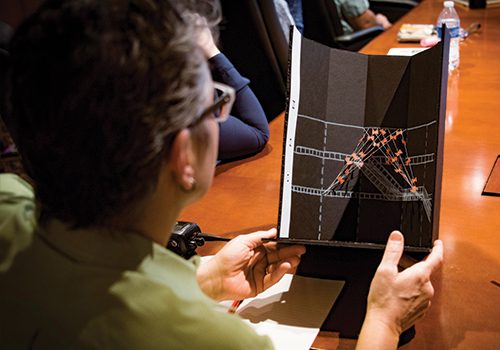 It’s a companion piece to State of Deception: The Power of Nazi Propaganda, an exhibit created by the United States Holocaust Memorial Museum that explores how the Nazis used propaganda to convince people in Germany to support their extremist messages. 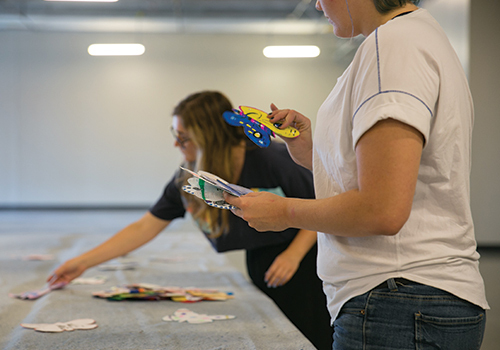 Alexandra Robinson, associate professor of Art, tapped students in her Visual Studies classes to team up on the installation. 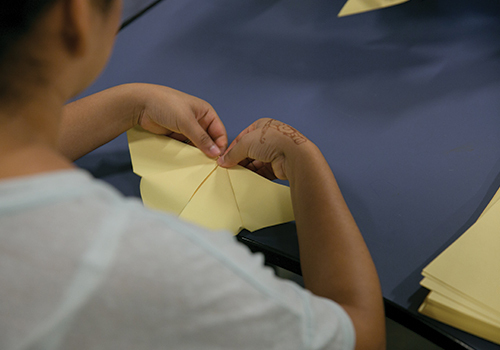 Working individually and in teams, students researched and developed seven designs for the art installation. 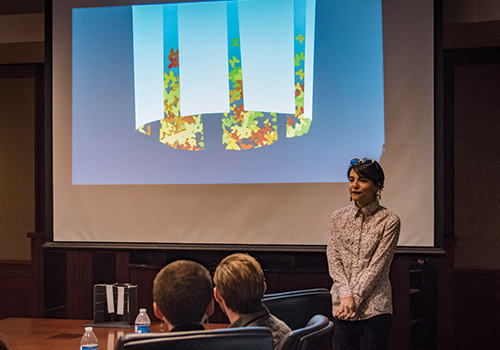 They gave oral and written presentations of their concepts to the museum’s administrative staff and supported their proposals with detailed schematics and 3-dimensional models. One design was chosen. 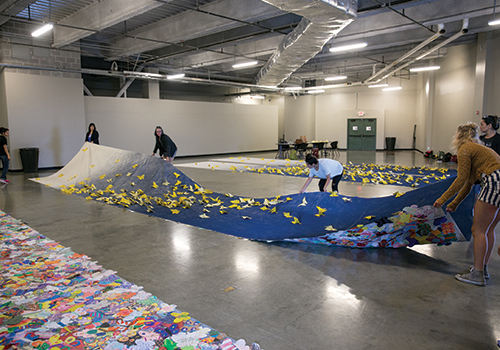 Over the next eight months, the students joined forces to refine, create and display the final installation. 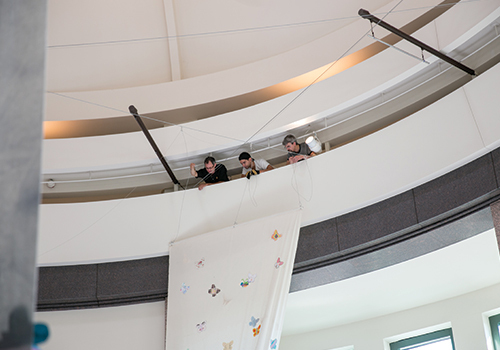 For the exhibit, six 40-foot fabric panels painted with a navy blue gradient hang in a circle inside the rotunda of the museum. 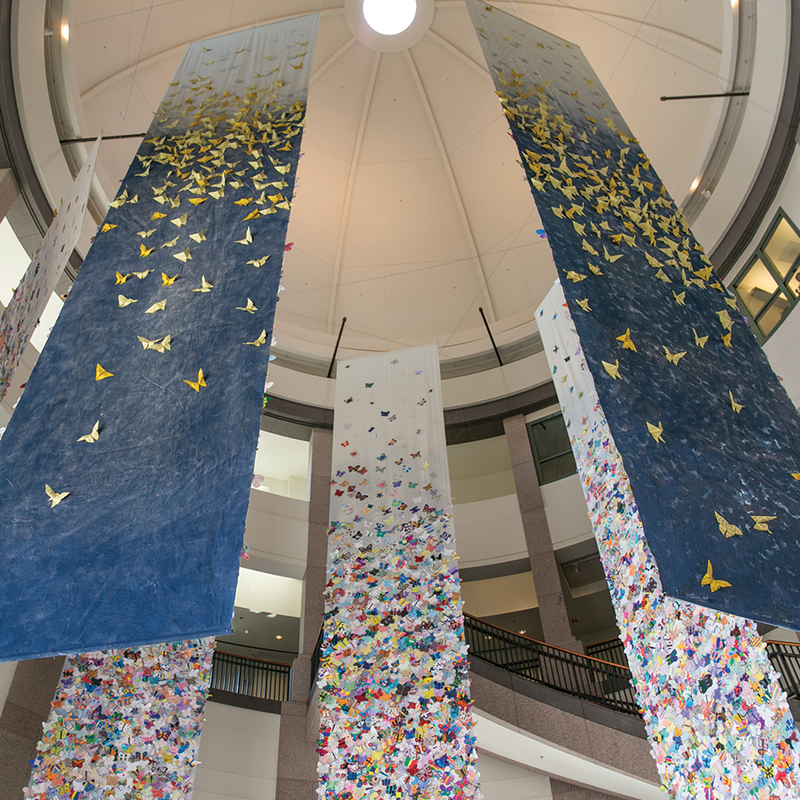 The exterior of each panel is embellished with yellow butterflies printed with the Mourner’s Kaddish (a Jewish prayer of mourning) in gold ink and representing the power and hope of those who stand against hate. 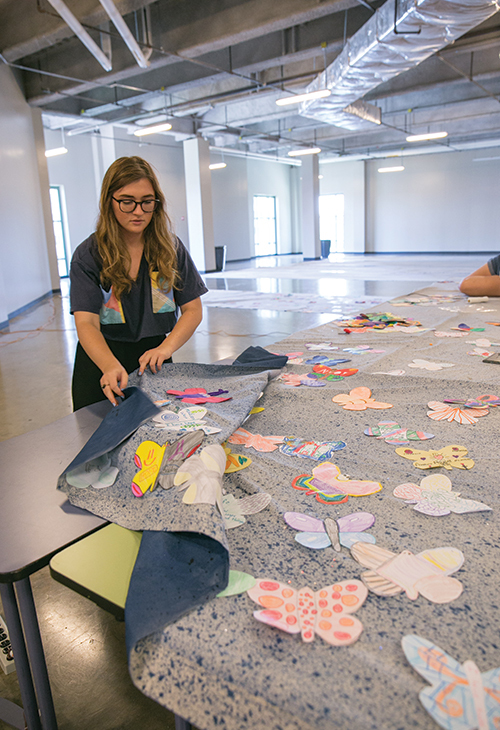 On the inside of the panels, about 5,000 paper butterflies decorated by children throughout Texas are attached. 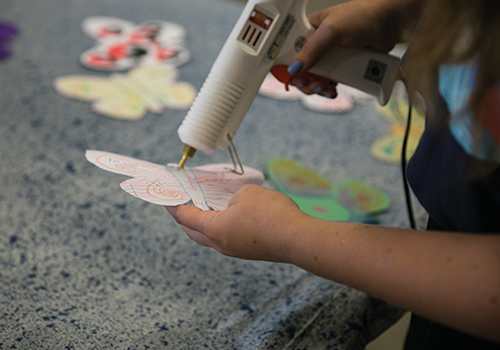 The children’s butterflies represent their pledge to be a voice against intolerance. 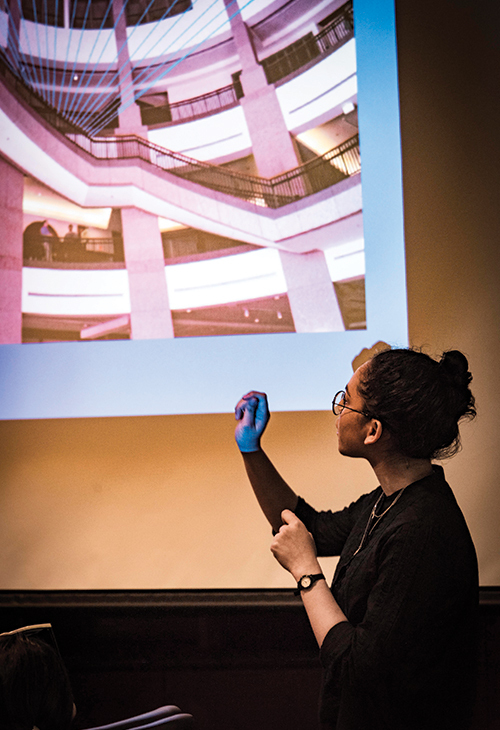 For Ana-Michelle DeSantiago ’17, having her concept chosen for the installation, and the help of her classmates to perfect the design, has made her feel “more optimistic” about her abilities and potential. 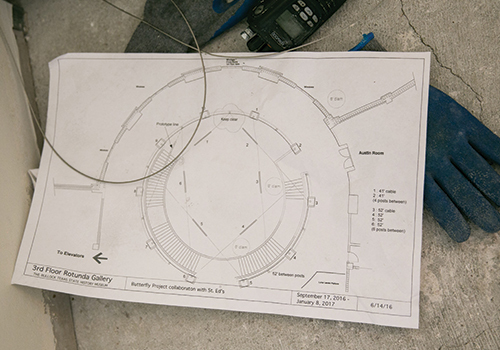 Lexi Brown ’18 echoes the positive effects of working on a large-scale exhibit for the public. 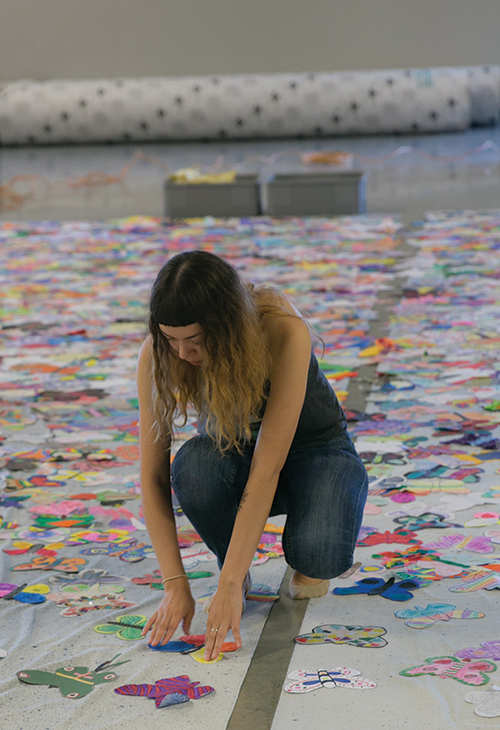 "It has raised my confidence to work in design and art installation,” she says.